GHSA now has a Mach 0.1/Condor 2 soaring simulator! We now have a soaring simulator! Come check it out! Jason Bridger, Todd Hahn, Alex Hahn and Michael Hunter put the Mach 0.1 soaring cockpit together on Friday night. Todd and Alex had previously built the computer and setup the Condor 2 soaring software. Because of the on-and-off weather on Saturday, some of our students used the simulator already! This will be a great addition to our set of instructional tools. We had 28 people at our annual banquet last night. Everyone attending had a good time. Lou almost burned the place down with his 12 pound brie. Thank you to ALL of our volunteers. You make this organization possible! Click on the right side of the photo to scroll through the photos. This past weekend, we hosted a two-day Flight Instructor Refresher Course (FIRC) that instructors must take every two years at our aviation center. Thanks to Rich Carlson, Tom Johnson, Russ Howard, and the Soaring Safety Foundation who put on the class and to Jamie Shore of SCOH for organizing. We had instructors and non-instructors from GHSA and from several other glider clubs attending. Lots of good discussion and learning! We also had operations this weekend, and had 16 flights, including two introductory flights. Work Day at the Field - Thanks for all the help! We had a work day today at the airfield. By my count, at least 24 people were here helping out, including a few new members who jumped right in. 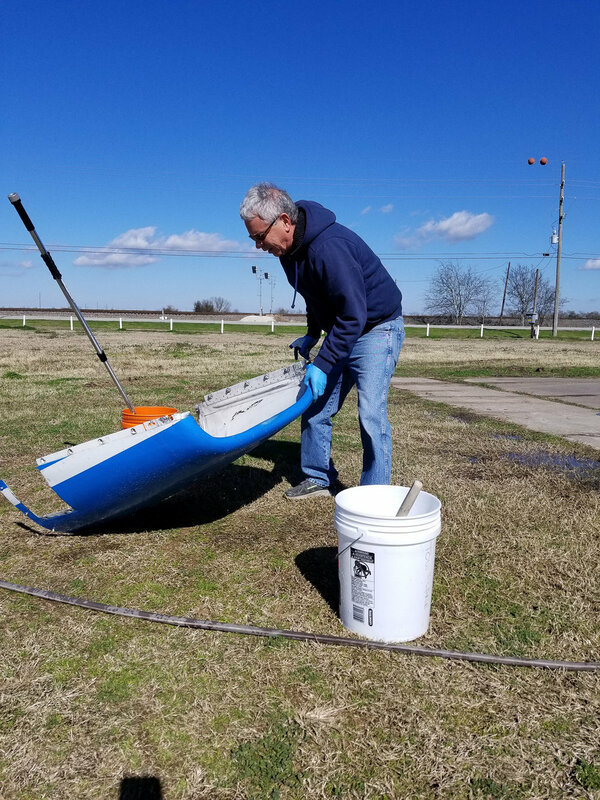 We pressure washed the deck and the hangar doors, cleaned out the hangar, worked on hangar door maintenance, painted door number lines, replaced light fixtures in the AV center, repaired the pump house, washed windows, and worked on lots of other miscellaneous fixes and improvements. Gary and Uwe cooked breakfast and lunch for the hungry volunteers. Thanks to everyone who came out today! It was great! And thanks much to Jason and Ken who organized the effort and did a lot of planning and prep work to make this a successful event. Thanks to Uwe for the photos. Wow, what a great day, even though the field was too wet to fly. First, I (Todd) gave a ground school lesson on Skew-T/Log-P plots and how I use them for forecasting the soaring day. After the lesson, we took advantage of the beautiful weather and sanded and repainted the doors on the Aviation Center. Pam, Adam, Dak, David B, Dak, and Jason helped all day long and we completed each door (eight of them!). Thanks everyone! Dak Davis (on the right in the photo), all of 20 years old and a member of the Greater Houston Soaring Association in Walls Texas, is now an FAA Certified Flight Instructor - Glider! He passed his CFI-G practical test today with Designated Pilot Examiner Gregg Squires (left) at Fault Line Flyers in Bertram, Texas. Dak now holds a commercial glider rating, an advanced ground instructor rating and a CFI-G rating. Congratulations to Dak on this huge accomplishment. Patrick Heer (R) soloed for the first time on Saturday with CFI-G Michael Hunter providing the instruction and sign-off. Looking on was Patrick’s father, Philippe, and also his grandfather. Congratulations Patrick! Have you ever heard the sound a sailplane makes as it flies overhead? One of the best sounds. GHSA member and towpilot Adam Harris took these photos of a Blanik L-23 glider landing at our field today. BERTRAM, TX - Fleeing a bad weather forecast near Houston, Greater Houston Soaring Association member Michael Hunter (R) drove to Fault Line Flyers to take his CFI-G test with Designated Pilot Examiner, and Fault Line Flyer member Gregg Squires (L) on Saturday, September 1, 2018. We're very excited to report that after a lot of hard work, and flying in an unfamiliar glider, Michael has passed his exam and has joined Greater Houston Soaring Association's pool of expert instructors. Congratulations, Michael! On August 11, David Buttram soloed in 4BA! Uwe Prigge was the supervising instructor. Congratulations David! Great spring day at GHSA! A great spring day at GHSA's Petmecky Field! We had 15 flights today courtesy of the tows from Adam. John and Brad received instruction from Uwe and then Brad then had a solo flight. Later, the weather improved and we even had some lift so Uwe in Oscar Alpha and Michael Hunter and I (Todd) in 5ST were up over an hour. Dak had a 2+ hour flight in the Ka-6CR (9P). These three gliders were in the same thermal a few times. Does that count as a gaggle? Thanks to all our volunteers who made today possible! Come on out and check out what soaring is all about. Chris Barnikow soloed right before sunset in one of GHSA's Blanik L-23s on Sunday. Congratulating Chris is instructor Mike Brooks after being doused by David Coggins. Way to go Chris! We had an amazing weekend with 40+ flights over both Saturday and Sunday with good lift to 4500+ feet. We had several flights over one hour: Brad (Blanik), Dean (Grob 102), Todd (Blanik, with friends), Mike H (KQ/DG-200), Uwe (Ventus), Jason (Ka-6). Trevor Mitchell also has his first three tows as a new tow pilot for GHSA on Sunday. Good job Trevor! GHSA's very own David Coggins has been selected to represent the United States in the World Gliding Championships 2018 in the open class. This is a very prestigious and select honor as only two pilots are selected to represent the United States at the WGC in the Open Class. David will take his JS1 to the Pribram airfield in the Czech Republic in July to compete. David pilots his JS1 glider. In this photo, Phillipe Heer is congratulating Brad on his first solo. Great job Brad! Uwe Prigge (on the right) passed his Certified Flight Instructor - Glider check ride today with DPE Gregg Squires! Please join me in congratulating Uwe. Alice Barnett soloed last weekend in the Blanik, with Stefan Murry observing. Way to go Alice! What is Carl up to under the wing? That can't be a bucket of water, could it? Jason Bridger successfully completed his check ride with Gregg Squires and received his Private Pilot license - Glider - on June 10. Congratulations, Jason! DPE, Gregg Squires (L), and Jason Bridger (R) after Jason's successful check ride. On April 15th, I made a time-lapse video of the clouds. These clouds are the result of rising air. We use this rising air to gain altitude in our gliders and stay aloft for hours. Excited to report that I got my 5 hour Silver Duration flight last Sunday in the Ka-6! Here is a photo of Steve landing in David's beautiful JS1 on Saturday. Steve went around and past College Station on his flight. There were great soaring conditions here just outside Houston this weekend.